kayi holige recipe | coconut puran poli | kayi obbattu | kobbari obbattu recipe with detailed photo recipe. coconut poli is an authentic festival recipe of karnataka. 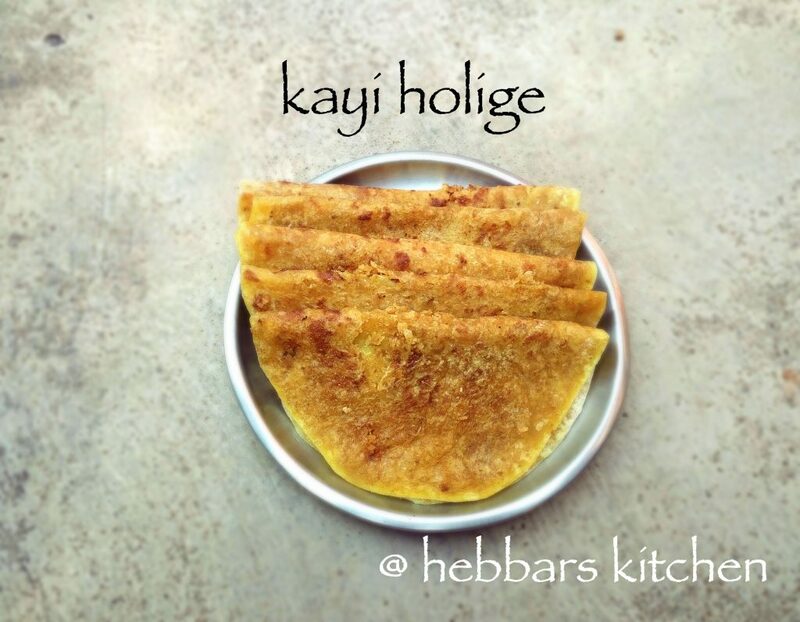 kayi holige recipe | coconut puran poli | kayi obbattu | kobbari obbattu recipe with step by step photo recipe. coconut obbattu or most commonly known as coconut poli is an sweet recipe prepared during festival like ganesh chauthi and nagara panchami. 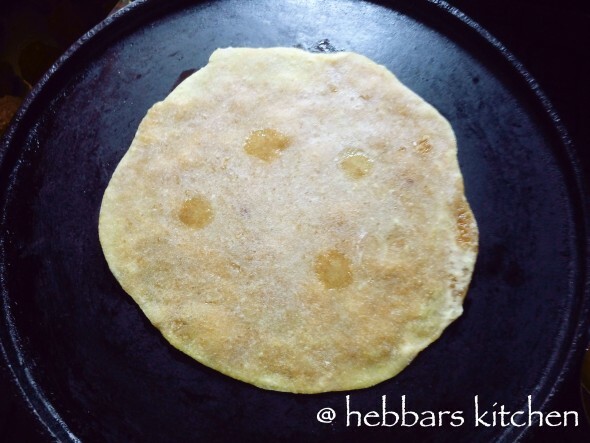 kobbari obbattu is prepared mainly using grated coconut and jaggery. 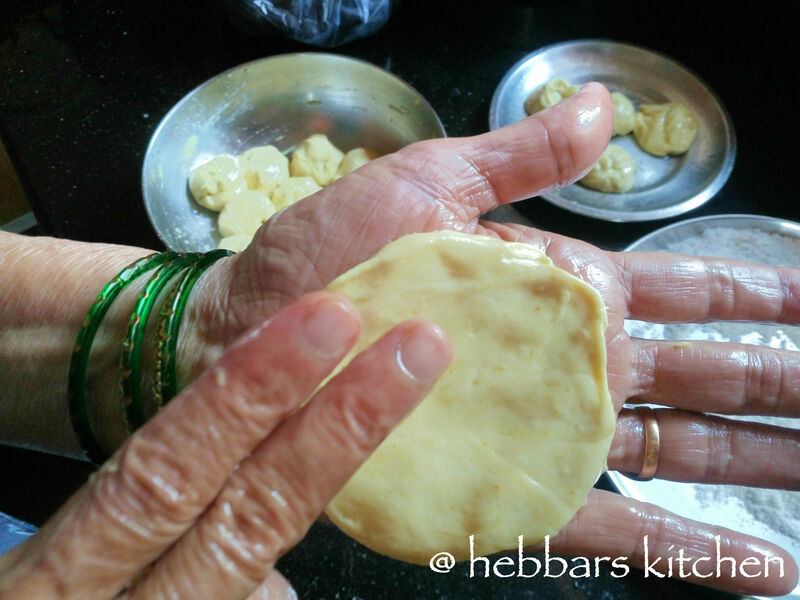 this recipe is prepared and shared by grandma – janaki doddamma. many many thanks to her. in karnataka we refer this as holige. however, it is known with different names across india. in maharashtra it is known with a different name – puran polis. 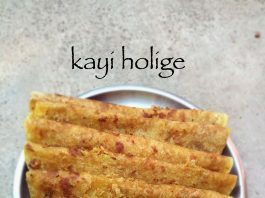 but according to me, kayi holige is very authentic to karnataka cuisine. 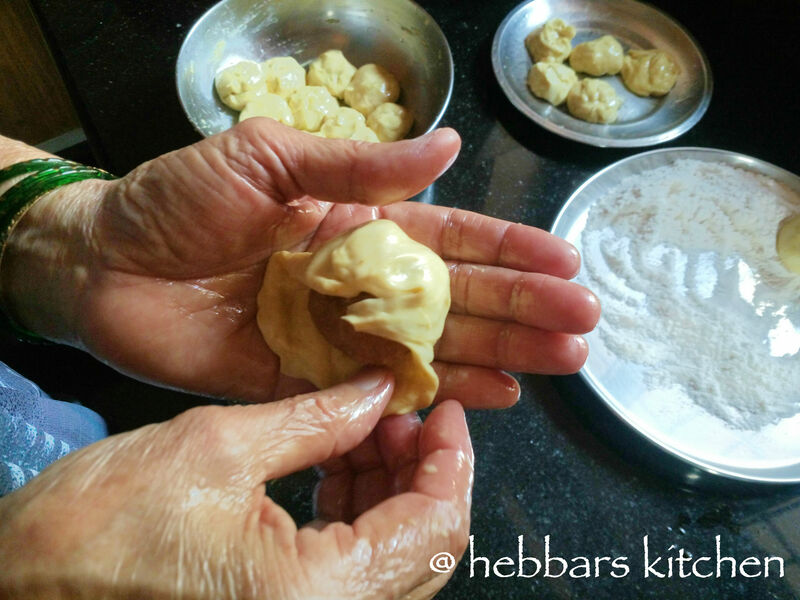 the difference between kobbari obbattu and traditional polis is the stuffing. 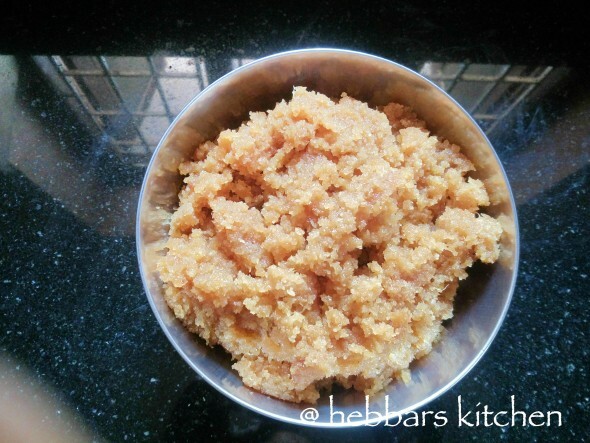 in this puran is made of coconut and jaggery compared to the dal and jaggery stuffing. 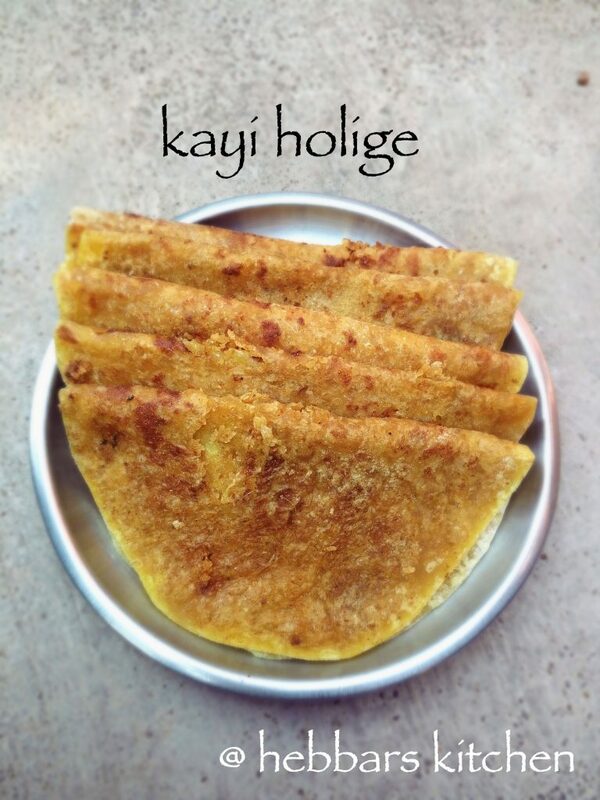 out of all the other obbattu’s recipes, i personally prefer and love kayi holige recipe. i use to just wait for ganesh chauthi every year to have coconut poli. even today, whenever i visit my hometown, i request my doddamma to prepare this recipe without any occasions. 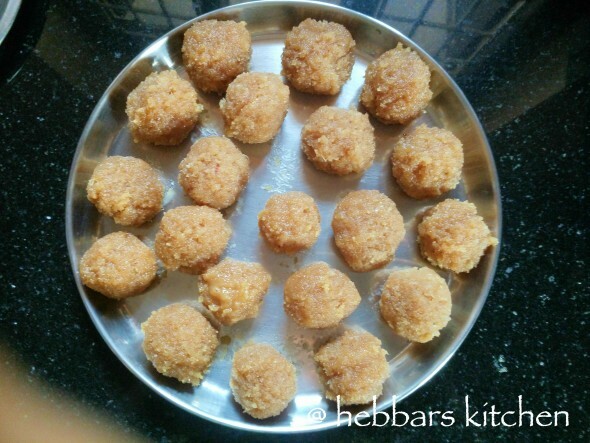 you can also check my other simple sweet recipes like dry fruits laddu, kaju katli recipe, besan laddo, chocolate mug cake, mango rasayana, gulab jamun, sheer khorma recipe and especially milk powder doodh peda. also, check out my other traditional south indian recipes like kotte kadubu, heere kai dose, neer dose and jolada rotti recipe. in a bowl, take sieved all purpose flour (maida) and turmeric powder. add water little by little to form a pliable dough. 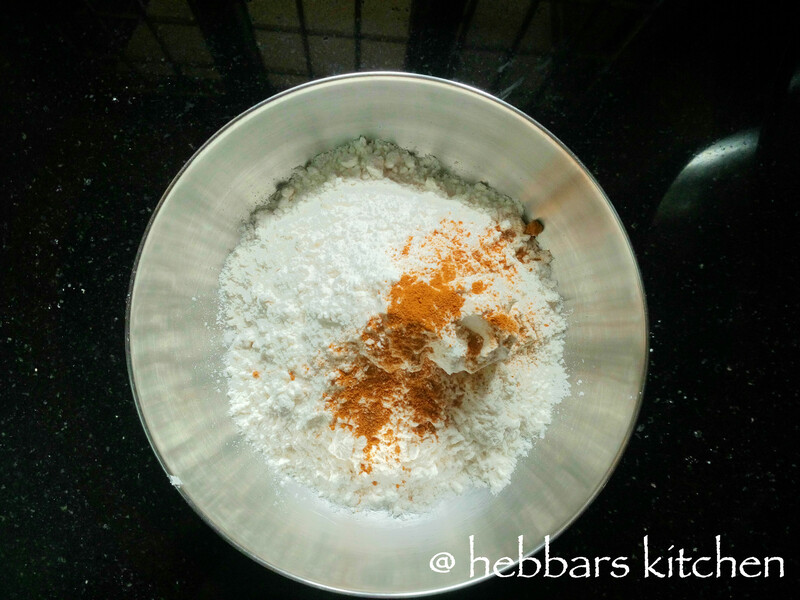 take 2 cups of freshly grated coconut and ground the grated coconut in the mixer grinder and keep it aside. in a heavy bottom pan add jaggery. and ½ cup of water into the kadai. 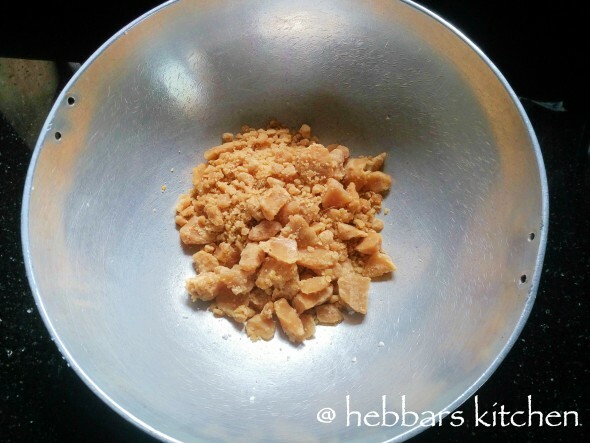 jaggery dissolves in water and you can see the froth. 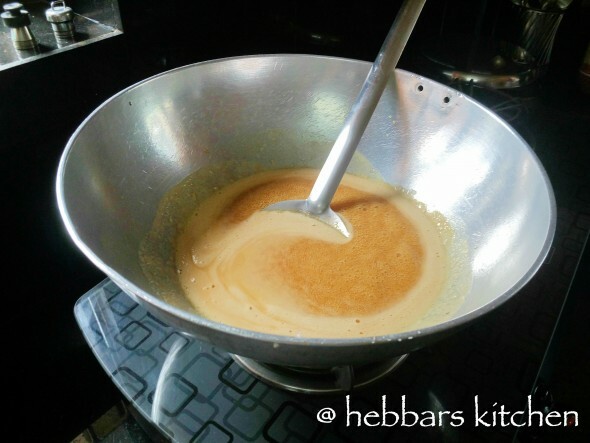 keep stirring until you get the thick syrup consistency. 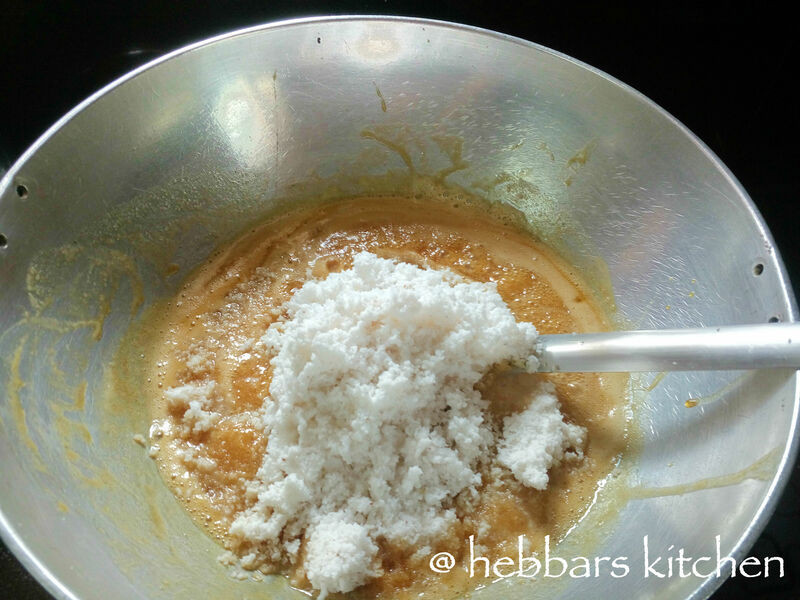 now add grounded coconut into the jaggery syrup. 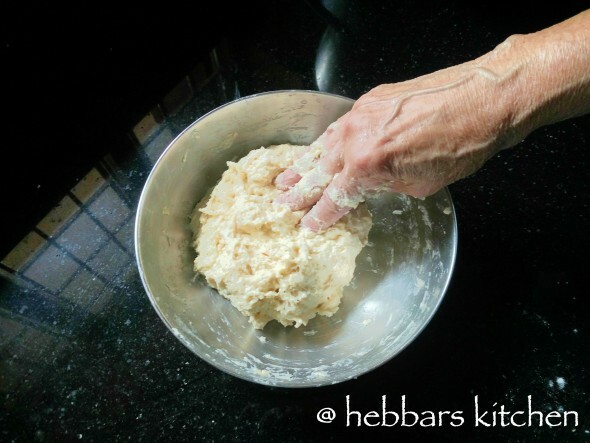 stir it well to form a thick paste. switch off the flame. coconut puran is ready for stuffing. make sure your hoorna or pooran is thick in consistency and can easily form balls. now add cardamom powder to the hoorna / puran and give a final mix. remove the hoorna in a wide bowl and allow it cool for some time. 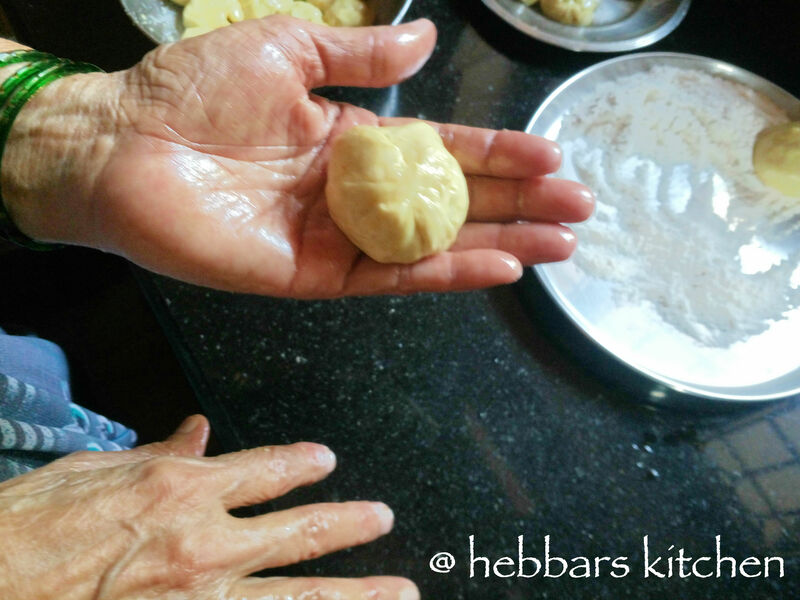 make small balls from coconut hoorna and keep it ready for stuffing. 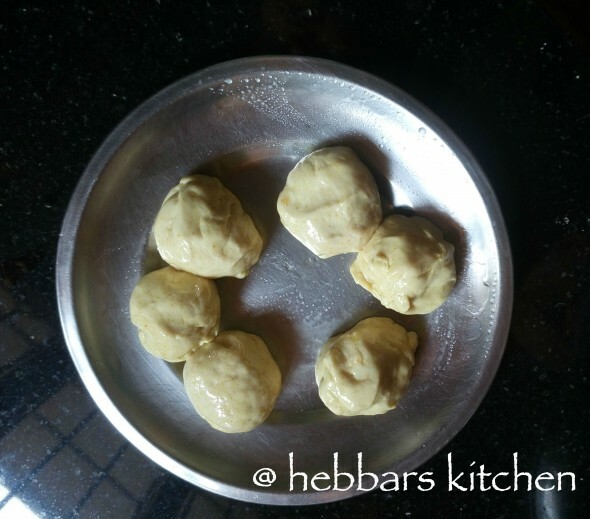 with prepared dough, make some small balls as shown below. now take one ball and flatten them with your fingers placing on your hand. 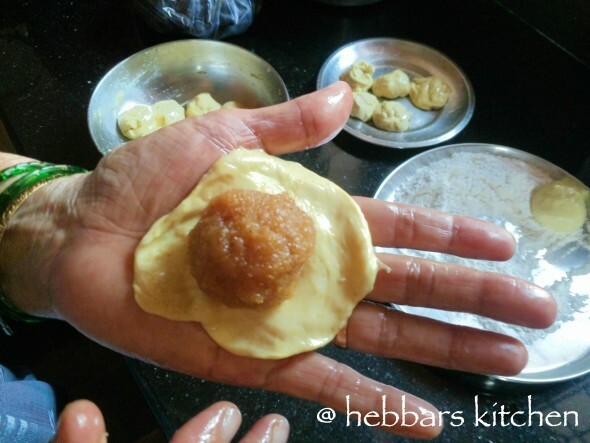 place the jaggery stuffing in the centre. take the edge and start pleating to cover the stuffing. 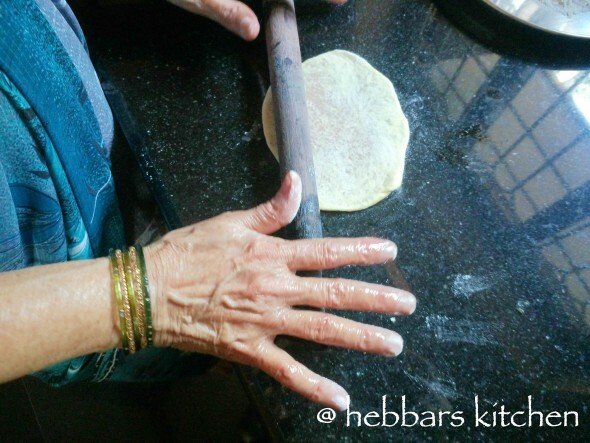 when the dough covers puran completely, seal it on top. dust enough rice flour, roll it very slowly. roll it in to medium thickness. heat the skillet and transfer the rolled puran on to skillet carefully. in medium flame, let it cook adding 4 drops of til oil. when small bubbles form, just flip it over to cook the other side. remove when it is cooked. your coconut poli is ready. 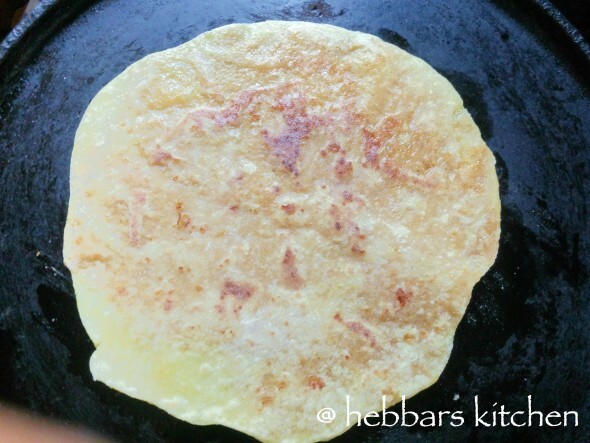 serve it with hot ghee. you can store these polis for two to three days without refrigeration. do not dust the dough with plain flour, instead use corn flour. 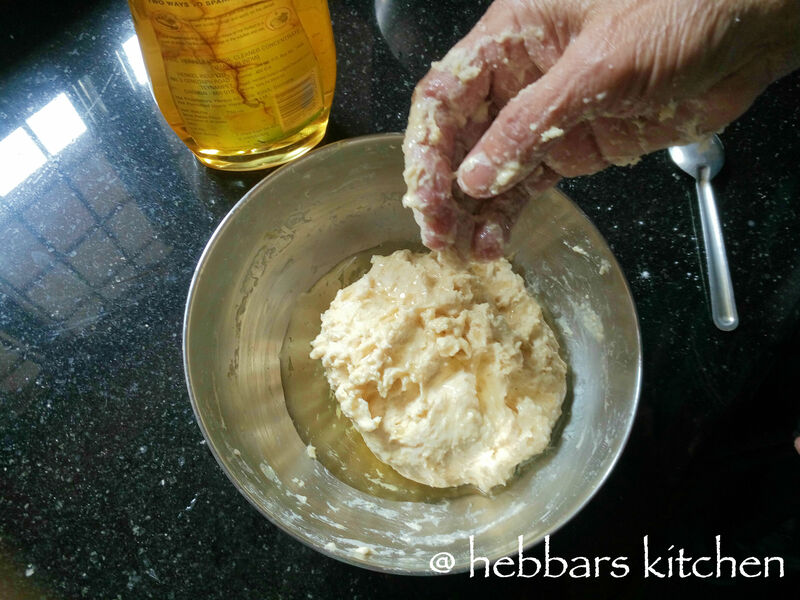 add til or sesame oil while kneading. this enhances the taste of coconut poli. Thanks for the recipe. Tried it out and it turned out perfect. Thank you,it came out perfect. I AM ARAVIND KARANTH MY PH NO 9480362673 REGULARLY I WANT HOLIGE LIKE 150 PC OR 200 OR 250 LIKE THAT CAN YOU SEND SIR? 1. I had not grinded the coconut very smooth in the mixer. So the coconut turned hard with sharp edges. 2. Add some water to the hardened poorna and leave it for an hour. It will turn soft which you can grind in the mixer again. 3. 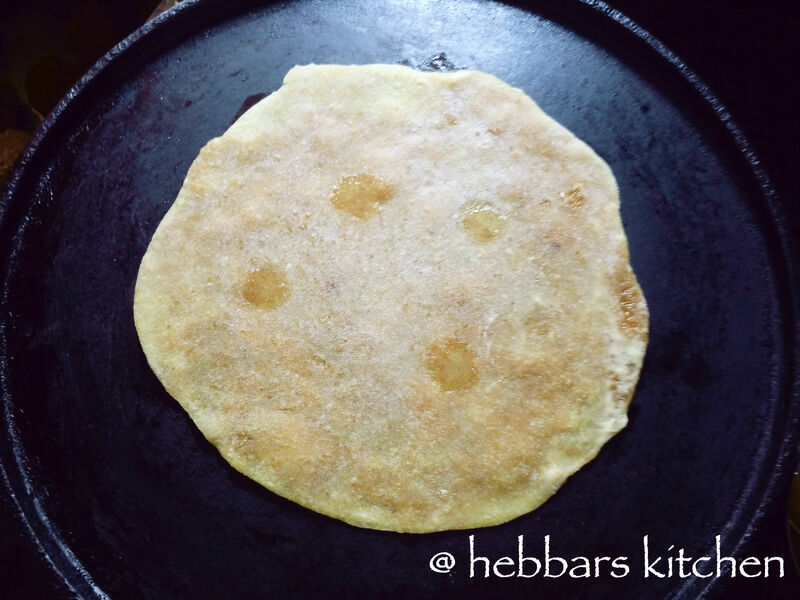 Reheat the pooran till it leaves the sides of the pan in a very low heat and continue with the steps again. 4. 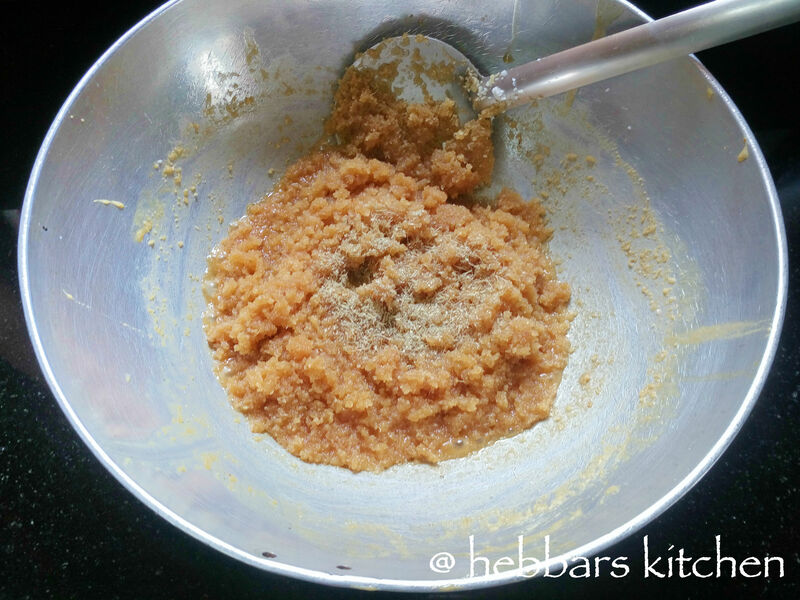 Can add some more jaggery or some more grated coconut on hand if the water is too much. did you use fresh coconut? 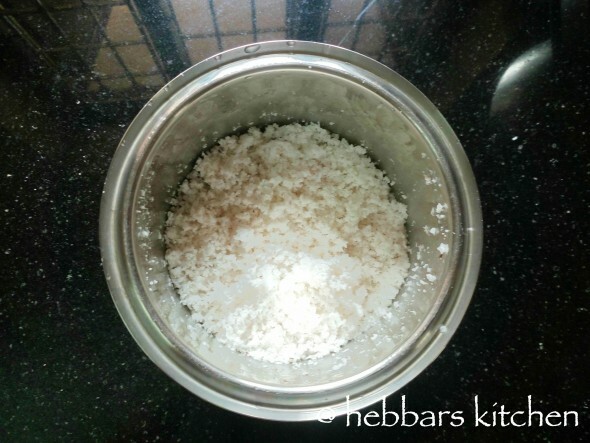 Is it kobbari or kaayi used for grinding in the puran ? its fresh coconut or kaayi. thanks sooraj. much appreciate it..